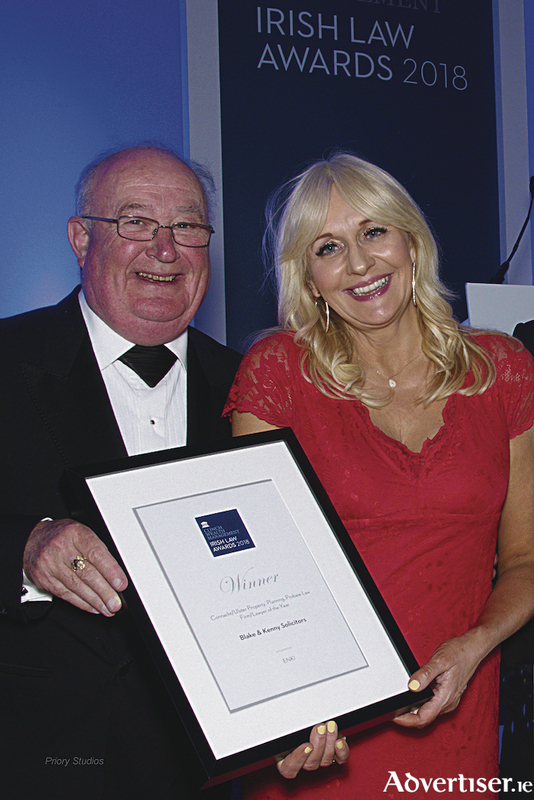 Miriam O’Callaghan presenting Michael Molloy of Blake & Kenny Solicitors, Galway, with Connacht/Ulster Law Firm of the Year for Property, Planning & Probate at the Irish Law Awards. Leading Galway law firm Blake & Kenny Solicitors has been named Property, Planning and Probate Law Firm of the Year for Connacht and Ulster in the prestigious 2018 Irish Law Awards. The annual awards programme celebrates the achievement of Ireland’s best law firms regionally and nationally while recognising excellence alongside their international peers. Blake & Kenny was also a finalist in two other categories, the Connacht/Ulster Law Firm of Year and the national award for Public Sector Law Firm of the Year. Partner at Blake & Kenny Michael Molloy said the firm was delighted to be recognised as the leading property, planning and probate law firm in the Connacht and Ulster. “The team at Blake & Kenny prides itself on its expertise, a thorough understanding of the property market and the needs of our clients, from individuals to large scale developers,” Mr Molloy said. “Particular thanks go to our staff for their commitment and hard work which gives us the edge in our sector.” The award recognises Blake & Kenny’s professionalism, experience and in-depth understanding of property, planning and probate, at both regional and a national level. The firm fought strong competition to be crowned winners of the prestigious title for 2018. Judges sought a legal team that excelled in the areas of property, planning and probate over the past 12 months, with particular attention given to those firms that carried out large and complex transactions. As one of Galway’s longest established law firms with a diverse range of practice areas, Blake & Kenny’s team of specialist property solicitors support first time buyers, investors and small to large scale residential and commercial developers. In the last 12 months Blake & Kenny has supported a number of high profile property and planning transactions, including commercial and residential developments (such as the construction of 102 homes at Maoilín, Ballymoneen Road, Galway by Burkeway Homes ), property investment, asset management, agricultural transactions, finance and commercial leases. The award also recognises Blake & Kenny’s achievement in probate and estate planning, with the firm offering specialist advisors that draft wills and ensure clients can plan to distribute their estate in the most tax efficient manner possible. Blake & Kenny also provides expertise in advising on and drafting Enduring Power of Attorney for clients who wish to protect large estates and is relevant where a client is of advancing years, but should be considered by anyone with a family history of Dementia or Alzheimer’s. Blake & Kenny has been supporting clients to achieve successful outcomes since 1892. With a large team of solicitors and professional staff, the firm provides full service in the areas of Property, Estate Planning and Probate, Medical Negligence and Personal Injury Law. Blake & Kenny is located at 2 Francis Street Galway or can be contacted on telephone 091 564 340.